Two robberies at gunpoint were reported within minutes in the Carrollton area Wednesday night, following an armed robbery on Magazine Street in the Garden District and a carjacking in Broadmoor the previous night and a carefully planned business holdup earlier this week, a crime spree that investigators say often intensifies as the holidays approach. The most recent robberies were reported at 12:05 a.m. and 12:14 a.m. Thursday in the Carrollton area. In the first case, two victims on Cherokee Street just off Freret were approached by a man with a silver semiautomatic who demanded their property, then left in a red truck, said Sgt. Chris Billiot of the NOPD Second District persons-crimes division. In the second case, a victim standing at the intersection of Spruce and Broadway streets was robbed by a man with a black handgun, who then left on foot, Billiot said. Despite the differences in the description of the gun and the fact that the red truck wasn’t seen in the second case, the close time and location of the two holdups suggests that the cases may be connected, possibly two or more people working together, Billiot said. Most likely, they considered the student population of the area easy pickings, he said. Tulane University is increasing its Safe Ride program in response to the robberies, according to the Hullabaloo student newspaper. On Tuesday night, a man got off of work at his grocery store job and took the bus to Magazine and Jackson streets, where his uncle was meeting him to walk home together, said Sgt. Sandra Contreras of the neighboring Sixth District’s persons-crime unit. As the two men neared First Street around 11:30 p.m., they were approached by two men with what appeared to be a chrome revolver who ordered them to the ground, then took their wallets and cell phones, Contreras said. It is unclear whether there are any connections between the Garden District case and the Carrollton shootings, Contreras said. Investigators are also continuing to investigate a carjacking that same night in Broadmoor and the armed robbery of the Sally Beauty Supply store on Magazine Street on Monday morning. About 40 sets of hair clippers were stolen in that case, an item that has been taken in a number of recent robberies and burglaries around the city because of its high resale value on the street, Billiot said. The clipper robbery was similar in circumstance to a holdup in late October at the nearby Vitamin Shoppe, but the gunman also showed a similar patience and planning in both cases, said Capt. Bruce Adams, the acting commander of the Uptown-based Second District. The gunman apparently was waiting for an opportune moment to confront the store clerk and made her lock the door while he waited for the safe’s timer to go off, then calmly left, Adams said. The store’s video camera caught his image, but he hid his face from it, and informants on the street seem to have no idea who he is, Billiot said. For all those reasons, it’s likely he will strike again, Adams said. Despite the limited number of patrolmen in the district, Adams has already augmented the Magazine Street beat with the district’s two Quality of Life officers to increase police presence for the month of December. 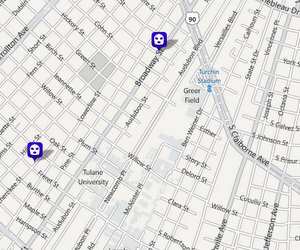 When schools let out, the district’s School Resource Officers will move to Magazine Street and the Quality of Life officers will patrol Oak and Tchoupitoulas, with the hopes that the increased number of officers will deter opportunistic criminals from targeting shoppers in Uptown’s retail corridors. What time did the robbery on ?Magazine and First St. occur? About 11:30 p.m. I added it into the article just now — thanks for pointing that out.